Once you have enabled a Receiver	to start receiving messages the new messages will display under Recent Messages	on the left side of the Interface dashboard. Messages that have an error occur will display under Open Tasks	and the Reciever will appear on the right side under Name. In this example, a File Reciever was set up and is displayed underName>FileReceiver. If you right-click one of the messages in the recent list you will get an action that allows you to view the message. In the next Figure -Received Message	you can see the receiver (or message source) for this message. In the designer folders view the whole HL7 message structure, and on the right-hand side, you have the ability to edit the message. There is an indicator on the bottom of this window that notifies whether or not the parser encountered any errors for the current message. Interface Dashboard	– a view of the most important data related to your messages being processed on this interface. Designer View	– a Decisions designer project where you can build flows, forms, rules, and reports related to this interface. Folder View	– an administrative view of all of the data in this interface. An interface is really a ‘folder’ of data elements and can have messages, tasks, and more. 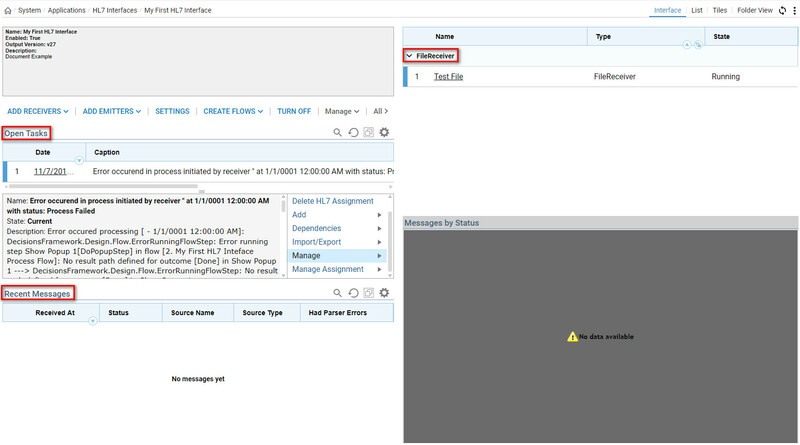 To define how this interface processes and deals with HL7 messages you need to switch to the Designer View shown in the next Figure -Designer View of Interface. 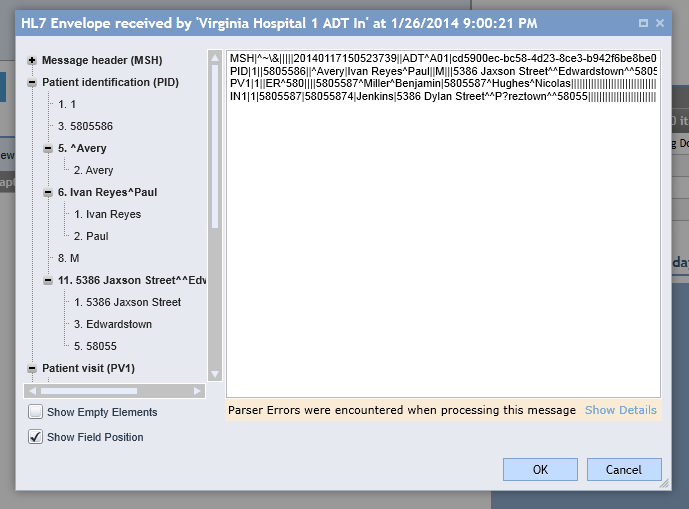 Important Note: All HL7 Interface flows expect a message envelope which contains multiple HL7 messages. This flow gets the HL7 message as text before the message is parsed into an actual HL7 object. The purpose of this flow is to allow you to perform manipulations on the message that may be required to make the message process successfully. If you have a system that sends nonstandard or malformed data but does this consistently or according to some rules you can make changes to the messages before the main processing happens within the Decisions platform. Because this flow works with the text of the message you can use any of the standard text and rule steps available in Decisions. We also provide a number of flow steps specific for helping deal with HL7 text that is in the ER7 format (broken up by pipe characters typically). Inserts the specified text (assumed to be a segment) at a position in a String of segments. HL7 relies on newline and carriage return characters that sometimes cause problems. You can use this step to remove these special characters. This takes the main text of the whole HL7 message which is assumed to be a list of messages and gives you each individual message as a String	of segments one at a time. Gets data from a specific segment by the position of the data in the segment. Returns a segment from the array of segments by segment type name. Gets the position or index of a specific segment. Takes aString	and converts it into a string with “message separator” characters in between each message. Takes aString	and converts it into an HL7 message with “segment separator” characters in between each segment. Removes all the segments with a matching type name. Substitutes new data in a segment by the position value. Splits an envelope (string) into a String	by the message separator character. Splits a message into a String	of segments by the segment separator character. The processing flow is where the Decisions HL7 engine provides the most value. By default, this flow is set up to do no work, so out of the box you can simply use the Decisions HL7 Mediator to receive messages from systems and send them right back out again unmodified. This can be very useful to create a single hub where messages are distributed to a wide range of systems in your environment, but the processing flow lets you inject behavior. The processing flow takes an HL7 Message Envelope as input. This envelope may have multiple HL7 messages in it. 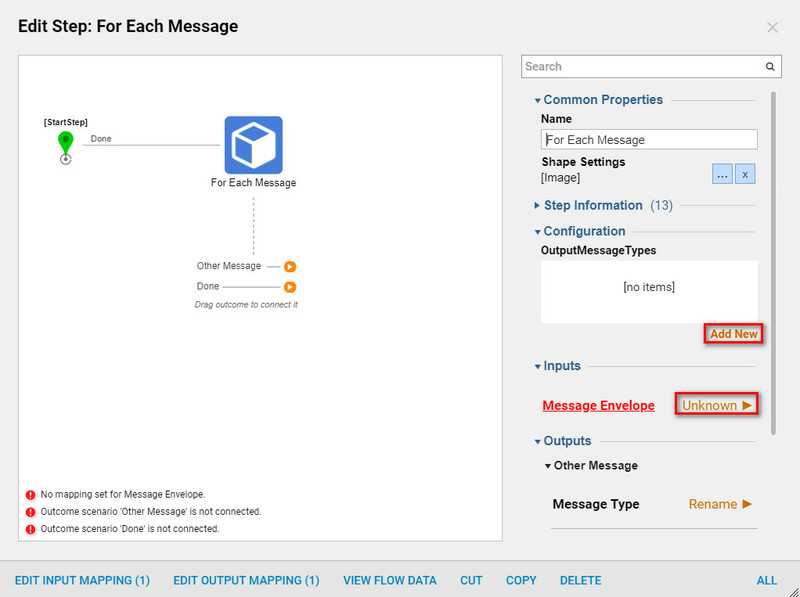 The flow outputs the same HL7 Message Envelope with messages changed, removed, or added so that the interface can send these messages along to other systems via the configured emitters. 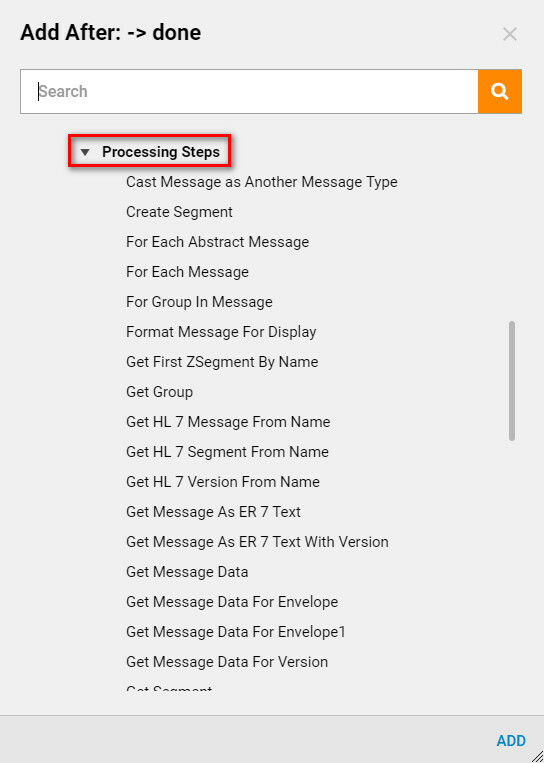 The processing flow also has a special set of HL7 message specific steps that can be used in the workflow engine. Most of these steps will have an obvious use to someone familiar with HL7 messages and syntax, however; A few of these steps require explanation because they are particularly useful. 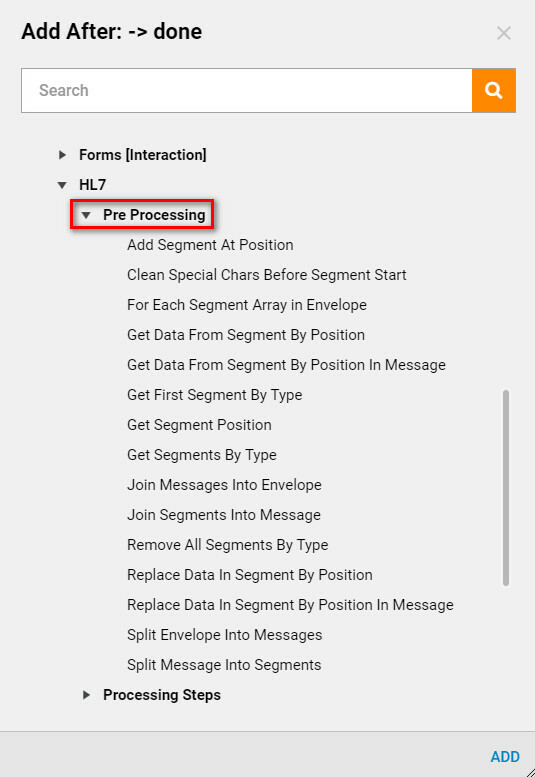 This step iterates through all of the HL7 messages in the envelope and allows you to work with one message at a time until your work is complete. This is commonly used with the Cast Message as Another Message Type step which lets you treat a message as another type. This step is similar to the one above except that you specify the message types you expect to be processing and you get separate paths for each message type to modify this message in the workflow. This step allows you to send a message directly to an interface at a specific ‘stage’ of the processing.